Ken Griffey, Jr. (center) and the Seattle Mariners celebrate after he scored the winning run in Game 5 of the 1995 ALDS. The Double was a double hit by the Seattle Mariners' Edgar Martínez in Game 5 of Major League Baseball's 1995 American League Division Series on October 8, 1995. Trailing by one run in the bottom half of the 11th inning, with Joey Cora on third base and Ken Griffey, Jr. on first, Martinez's hit drove in Cora and Griffey, giving the Mariners a 6–5 victory over the New York Yankees to clinch the series, 3–2. The play is held to be the "biggest hit in franchise history." Amid rumors that the team would be sold and/or relocated, the Mariners—who had had only two winning seasons (1991 and 1993) since beginning play in 1977—mounted a late-season comeback in 1995 to clinch their first postseason appearance in franchise history. They then mounted a series of comebacks in the ALDS, first overcoming a 2-game series deficit to force a deciding Game 5, then tying Game 5 in the 8th inning to force extra innings, and finally a one-run 11th inning deficit that was overcome by the Double. The hit is regarded as the defining moment of Martinez's 18-year Major League Baseball career. Mariners broadcaster Dave Niehaus' call of the play—which is equally memorable to Seattle fans as the play itself—is also regarded as the highlight of his career. The play is also credited with keeping a Major League Baseball team in the city of Seattle, as it helped garner support for a new taxpayer-funded stadium for the Mariners. That stadium, known today as Safeco Field, opened in 1999, with the Double depicted in a mural as part of the stadium's art collection. The Kingdome, the Mariners' home stadium from 1977–1999, and site of The Double. For several years the Mariners had been dogged by rumors that the team's ownership group led by Jeff Smulyan had been considering selling and/or relocating the team to a different city. 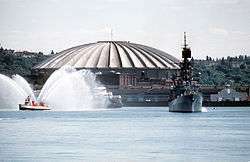 This was primarily due to low attendance and revenue, the team's losing ways (prior to 1995, they only had two seasons with a winning percentage over .500), and the Kingdome's drab baseball environment. In 1992, Smulyan's ownership group sold the Mariners to the Baseball Club of Seattle, a consortium led by Hiroshi Yamauchi and later Nintendo of America. As of 2014, they are still the Mariners' owners. Almost immediately, the new ownership group began campaigning with local and state governments to gain public funding for a new stadium. In an election held on September 19, 1995, the residents of King County voted against a 1-percentage-point sales tax increase to fund the building of a replacement stadium. As a result, the ownership group set an October 30 deadline for local leadership to come up with a plan to finance a new stadium, or they would put the team up for sale. After being as many as 13 games out of first place at the beginning of August, the Mariners mounted a late-season comeback that, coupled with a late-season collapse by the California Angels, forced a tiebreaker between the two teams. The Mariners won the tiebreaker, 9–1, winning their first division title and postseason trip in franchise history. In the ALDS, the Mariners quickly fell into a 2–0 deficit to the Yankees in the best-of-five series. However, the Mariners won the next two games and forced a "winner-takes-all" Game 5 at the Kingdome. After the Yankees took a 4–2 lead on a Don Mattingly 2-RBI double in the 6th inning, the Mariners came back to tie the score at 4 in the 8th inning and eventually forced extra innings. In the top of the 11th inning, the Yankees scored a run on an RBI single by Randy Velarde and were three outs from reaching the American League Championship Series. In the bottom half of the inning, Yankees ace Jack McDowell, who had entered the game in the 9th inning for a rare relief appearance, faced Joey Cora, Ken Griffey, Jr., and Edgar Martínez—the second, third, and fourth batters in the Mariners' order, respectively. Second baseman Cora dragged a bunt down the first base line and reached first base safely on an infield hit. Yankees manager Buck Showalter argued the call, believing Cora should have been called out for running off the baselines; however, the umpires' ruling stood. Center fielder Griffey singled to short right-center field, allowing Cora to reach third base. Designated hitter Martinez then doubled down the left field line, scoring Cora with the tying run and Griffey with the winning run. The Mariners' dugout emptied and mobbed Griffey, Martinez, and Cora on the field in celebration of the franchise's first ever playoff series victory. "1995 AL Division Series Winning Call"
The winning call of the 1995 American League Division Series as called by Dave Niehaus, one of his most famous calls. Musberger's call, dramatic as it was, incorrectly implied that Bernie Williams fielded the double in left. Bernie was playing center field at the time. Gerald Williams was in left field playing the ball and making the late throw back to the infield. Safeco Field, home of the Mariners since 1999. The Double is credited with helping to spur public funding for Safeco Field. The Mariners' late season comeback, their first division title in franchise history, and ultimately the Double, brought the Seattle fan base back to life and sparked a desire to keep the team in town. Lou Piniella, the Mariners' manager from 1993–2002, called Martinez's hit and the 1995 postseason "the hit, the run, the game, the series and the season that saved baseball in Seattle." 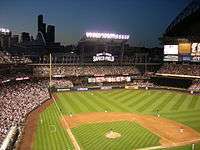 Soon after the events of October 8, the Washington State Legislature held a special session and approved an alternative funding package to enable the building of a new ballpark, which culminated in the construction of Safeco Field. The Double is regarded by Seattle fans and Martinez himself as the defining moment of Martinez's 18-year Major League Baseball career – which was played exclusively with the Mariners – and was one of several highlights of Mariners franchise history in which Martinez played a major role. In 2004, the city of Seattle renamed a street near Safeco Field "Edgar Martínez Drive" to honor Martinez's contributions to the Mariners, including his double that "saved baseball in Seattle." Martinez was inducted into the Mariners Hall of Fame in 2007. The image of Griffey at the bottom of the dogpile after scoring the winning run is one of the most memorable images of Griffey's storied career with the Mariners. In 2007, when Griffey returned to Seattle for the first time since his 1999 trade to the Cincinnati Reds, that image was included in a photo collage of highlights of Griffey's Mariners career that was presented to him by former teammates Martinez and Jay Buhner (both retired by then). The image of Griffey sliding into home plate has been immortalized in a mural at Safeco Field called The Defining Moment. Griffey's slide into home plate was also the inspiration behind the title of the 1996 video game Ken Griffey, Jr.'s Winning Run. 1 2 3 4 Associated Press (2004-09-25). "Martinez is beloved by Seattle fans; what about Hall voters?". ESPN.com. Retrieved 2009-03-25. 1 2 Finnigan, Bob (2004-08-10). "How Martinez arrived at his decision to retire". The Seattle Times. Retrieved 2009-03-30. ↑ Andriesen, David (2008-03-25). "Will Edgar Martinez head to Hall of Fame?". Seattle Post-Intelligencer. Retrieved 2009-03-25. 1 2 Smith, Claire (1991-09-12). "Owners Focus on Mariners' Future". The New York Times. Retrieved 2009-03-30. ↑ Judd, Ron; Joni Balter (1991-12-11). "M's Likely Here in '92". The Seattle Times. Retrieved 2009-03-30. ↑ "Seattle Mariners Attendance, Stadiums and Park Factors". Baseball-Reference.com. Retrieved 2009-03-25. ↑ "Kingdome - Seattle Mariners". Ballparks of Baseball. Retrieved 2009-03-30. ↑ Farrey, Tom; Joni Balter (1992-06-09). "M's Sale Gets Go-Ahead - Full Acceptance of Offer Predicted for Tomorrow". The Seattle Times. Retrieved 2009-03-30. ↑ Finnigan, Bob (2004-11-30). "M's will not be sold". The Seattle Times. Retrieved 2009-03-30. 1 2 "Safeco Field History". Seattle Mariners official website. Retrieved 2008-06-15. 1 2 Licata, Nick (1999-06-27). "Urban Politics #66". Office of Seattle City Councilmember Nick Licata. Retrieved 2009-03-30. ↑ Schaefer, David; David Postman (1995-09-28). "M's Set Oct. 30 Deadline". The Seattle Times. Retrieved 2009-03-30. ↑ "1995 Seattle Mariners Schedule, Box Scores and Splits". Baseball-Reference.com. Retrieved 2009-03-25. ↑ "1995 California Angels Schedule, Box Score and Splits". Baseball-Reference.com. Retrieved 2009-03-25. ↑ "October 2, 1995 California Angels at Seattle Mariners Box Score and Play by Play". Baseball-Reference.com. Retrieved 2009-03-25. 1 2 "1995 AL Division Series - SEA vs. NYY". Baseball-Reference.com. Retrieved 2009-03-25. 1 2 3 4 5 6 "October 8, 1995 American League Division Series (ALDS) Game 5 Box Score and Play by Play". Baseball-Reference.com. Retrieved 2009-03-25. ↑ Stone, Larry (2008-07-27). "My, oh my, forever". The Seattle Times. Archived from the original on August 20, 2009. Retrieved 2009-03-25. ↑ Arnold, Kirby (2008-02-20). "Hall of Fame for Mariners announcer Dave Niehaus". The Herald. Everett, Washington. Retrieved 2009-05-15. 1 2 Andriesen, David (2003-03-28). "Edgar Martinez: The king of swing". Seattle Post-Intelligencer. Retrieved 2009-03-30. ↑ "Nickels honors baseball legend with new Edgar Martinez Drive". City of Seattle Office of the Mayor. 2004-10-04. Retrieved 2009-03-25. ↑ Romero, José Miguel (2007-06-03). "Mariners, fans salute Edgar". The Seattle Times. Retrieved 2009-05-13. ↑ Ko, Michael (2007-06-23). "Plenty of cheers to greet Griffey". The Seattle Times. Retrieved 2009-03-25. ↑ "Art in the Park". Seattle Mariners official website. Retrieved 2009-03-25. This article is issued from Wikipedia - version of the 9/11/2016. The text is available under the Creative Commons Attribution/Share Alike but additional terms may apply for the media files.